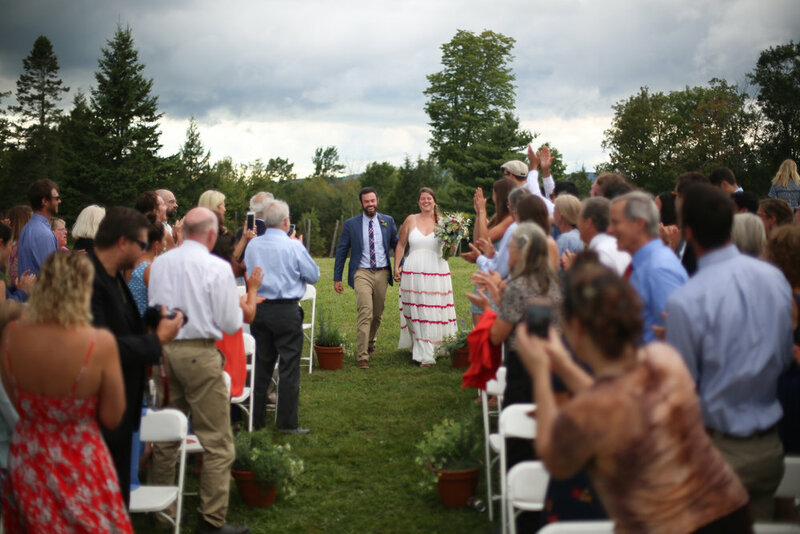 Maggie and John had an incredible wedding weekend that culminated in their amazing wedding on August 19, 2017 at Camp Hosmer Point in Craftsbury Common, Vermont. They took over an entire summer camp and invited their guests (and photographer) to come Friday night through Sunday morning. It was amazing. Friday night started with a pig roast and taco night all cooked by Maggie and John's friends. After the delicious dinner and a few toasts to get the celebration going everyone participated in a square dance lesson and some real life square dancing with a live band. It was a great way to kick off the weekend. Saturday found Maggie and John's guests enjoying the amenities of the camp, including the slightly terrifying waterslide into the lake and a few competitive games of volleyball on the beach. The formal events of the day kicked off with couple and family photos before their wonderful outdoor ceremony. The rain in the forecast held out until the moment the ceremony ended, which sent everyone happily scurrying towards the cocktail hour. The multi-course dinner was punctuated with multiple toasts and cheers and the night continued with dancing well into the night. This was a magical weekend, one that I was so happy to be a part of!